Friendly helpful staff and clean facility. Pull through sites need to be leveled. Traveled by Class A and I don't have 6+ inches on adjustment on my unit the level it, as is the case with most class A's. We chose this park due to proximity for a wedding nearby and the ratings. The ratings were correct. This is a nice park where everything worked properly. The A/C, coffee maker and microwave did not kick off like other parks. The pool is big and clean. The bathrooms were clean and in good repair. Very little leveling on our site was needed. The staff was very friendly. I rated it 5 stars for condition of buildings, pool and amenities. I rated the appeal a 4 due to a few long term campers that took a little away from the park. We would certainly visit again if needed and do recommend it. The animals were fun. First thing's first. If you just want to go for a local trip the day pass is like $7.00 Secondly, we are first time campers with a daughter who is 3. We set everything up by ourselves and it was awesome. There are rules but the biggest one is that quiet time is from 9 pm to 8am. The facilities are clean and well maintained. If you have a camper or RV the rangers will assist you in getting parked. 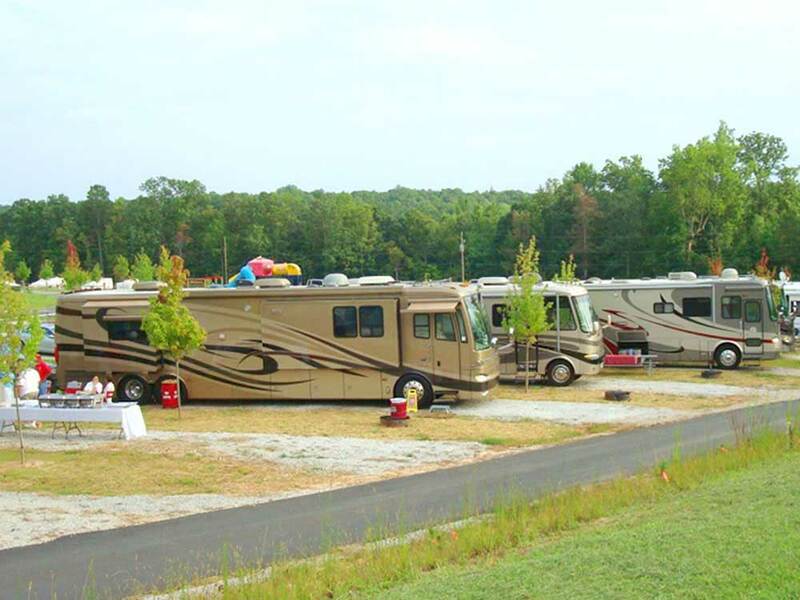 All tent sites and rv sites are full water electric hookups. RVs also have the sewers as well as direct tv lots. Each site has a grill and a picnic table. After setting our tent up we enjoyed the pool to cool off. The pool is 3 1/2 feet deep to 4 1/2 feet deep. That's as deep as it gets. The kiddie pol is 1 1/2 feet deep. There is a train ride, gem mining, exotic animals (aligators are in their own pen with two fences surrounding them and the gates are locked super tight. Fence is 8 feet high and there are signs all around the enclosure. There are two playgrounds one for smaller children and one for older children. There's movies in the outdoor theater and there is mini golf and an arcade room. Also on site is a very clean and well maintained comfort station aka restroom/showers. There is also an on-site laundry station. Last night we couldn't find any of our seasonings for our food we wanted to cook and we were able to purchase what we needed from the ranger station. Each week is a themed week. This weekend was Science themed. If you were there Friday Sat etc you worked with volcanoes. Overall, we really enjoyed our first time as tent campers. We made new friends and hope to camp there again soon whether via tent or pop up camper. We were staying after a very rainy period but grounds seemed very ragged. Enjoyed seeing the many kinds of animals on site, just hope they were well cared for. Some of the animal facilities looked unkept also. Internet was not good: weak and kept dropping off. This may be a great place for children in the middle of summer. Was ok for just an overnight stay. Came here with our family, after making a reservation over the phone, paid in full. Very disappointed with check-in, as the women said several times she had no record of our reservation. She even asked me to spell our name, and I am sure there were no others with a name like ours scheduled to check in on the same day. One of the attractions of this place was supposed to be activities for the kids, but I was not given any such information on check-in and had to ask. Went to the scheduled Yogi cartoon show, and found nothing. Had to ask to get that started and there were several technical issues. Then were told before it finished we had to be out in three minutes so they could close the office. On the positive side, our kids seemed oblivious to the lack of customer service and enjoyed the playground and pool. What is with the wristbands? I can understand why the kids would need to wear them, but adults? We will not be back. Restrooms and showers were always clean! Very friendly team of rangers, we will definitely return here. Fun for the kids also with the turtles and birds! Also mini golf.